We love Vietnamese cuisine because it embraces flavors that are big, bright, and dazzling without feeling heavy. 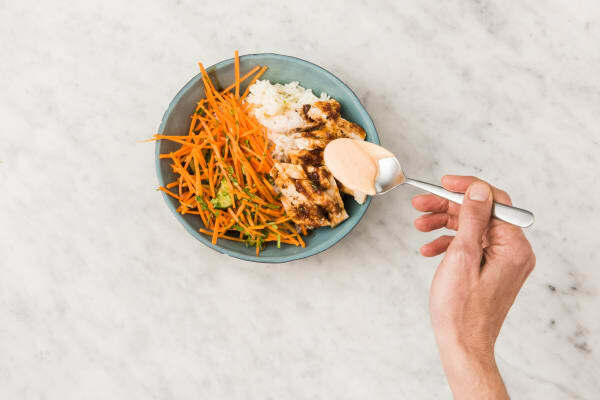 This recipe is a great example because it combines chicken, rice, and crisp veggies in a way that is incredibly well-balanced. The meat is drizzled in a savory-spicy sauce with soy, lime, and sriracha. 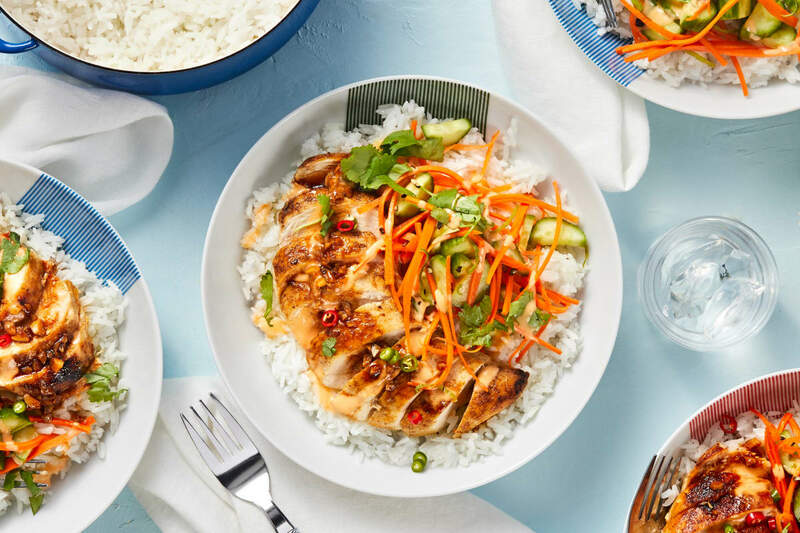 Next to it, there’s fluffy jasmine rice and a zesty carrot and cucumber salad with cilantro. When piled together in a bowl, it’s simple, satisfying dinner perfection. Wash and dry all produce. Mince or grate garlic. 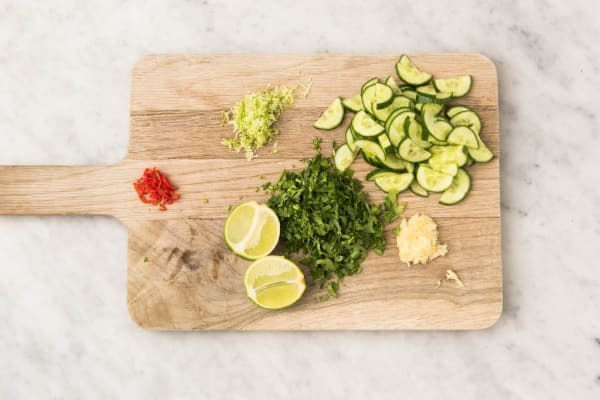 Halve cucumbers lengthwise, then cut crosswise into thin half-moons. Roughly chop cilantro. Zest 2 tsp zest from limes, then halve each. Thinly slice chilis, removing ribs and seeds first for less heat. 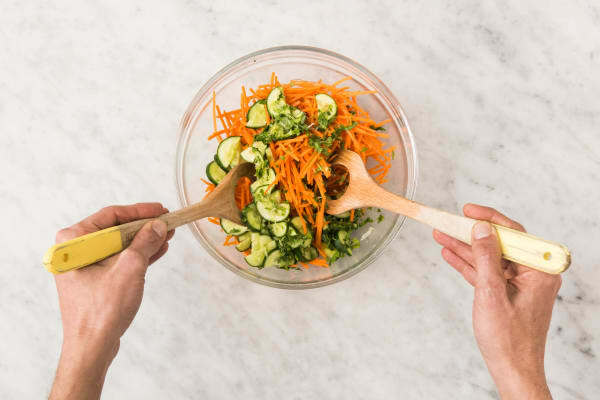 In a medium bowl, combine cucumbers, carrots, half the lime zest, half the cilantro, juice from two lime halves, salt, and pepper. Place rice, 1¾ cups water, and pinch of salt in a medium pot. Bring to a boil, then cover and reduce heat to a gentle simmer. Cook until tender, 15-20 minutes. Heat a large drizzle of oil in a large pan over medium-high heat. Pat chicken dry with a paper towel and season with salt and pepper. Add to pan and cook until browned and no longer pink throughout, 2-4 minutes per side. Remove from pan and transfer to a plate to rest. Heat a drizzle of oil in same pan over medium heat. Add garlic and cook until fragrant, 30 seconds. Reduce heat to low and stir in soy sauce, half the sriracha, 1½ TBSP sugar, and juice from remaining lime halves. Let simmer, stirring, until thick and syrupy, 30 seconds to 1 minute. Remove pan from heat. 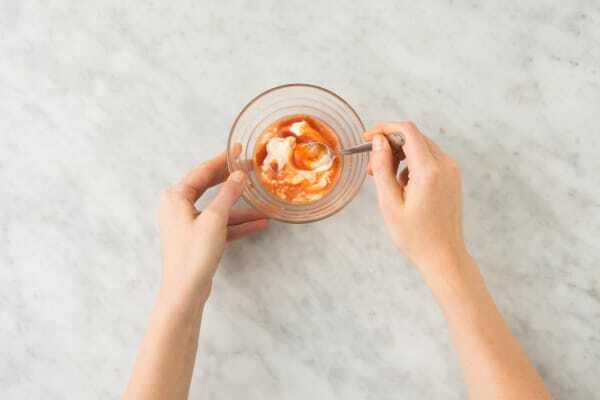 In a small bowl, combine mayonnaise, remaining sriracha, and enough water to reach a drizzling consistency (start with 2 tsp). Season with salt and pepper. Fluff rice with a fork, then stir in remaining lime zest and 2 TBSP butter. Season with salt and pepper. 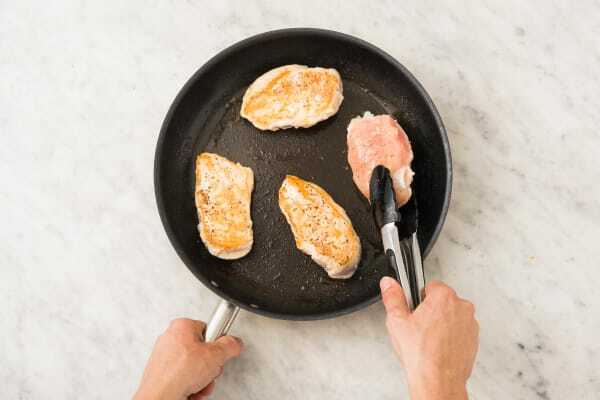 Thinly slice chicken. Divide rice between bowls. Top with chicken and salad. 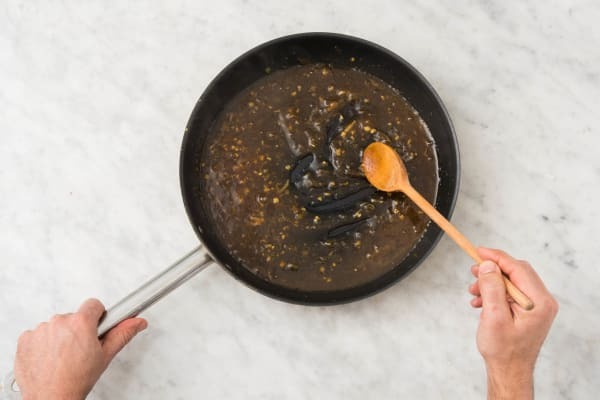 Spoon sauce from pan over chicken. Drizzle everything with sriracha mayo. Garnish with remaining cilantro and chili to taste.